La Camera | take your marks. go. Brunch is fast becoming something of a tradition for Lydia and myself if we both have the morning off. Busy schedules and long days mean we’re often all in and out of the flat at different times, but Sunday’s and Monday’s are usually free for us to find a new brunch hole and set our day’s off just right. We don’t quite live in the middle of Chapel Street, but we’re central enough that a venture in either direction is worth it and usually we have enough time waiting for the lights to change to decide. Today we went left. Left is fast becoming our thing. 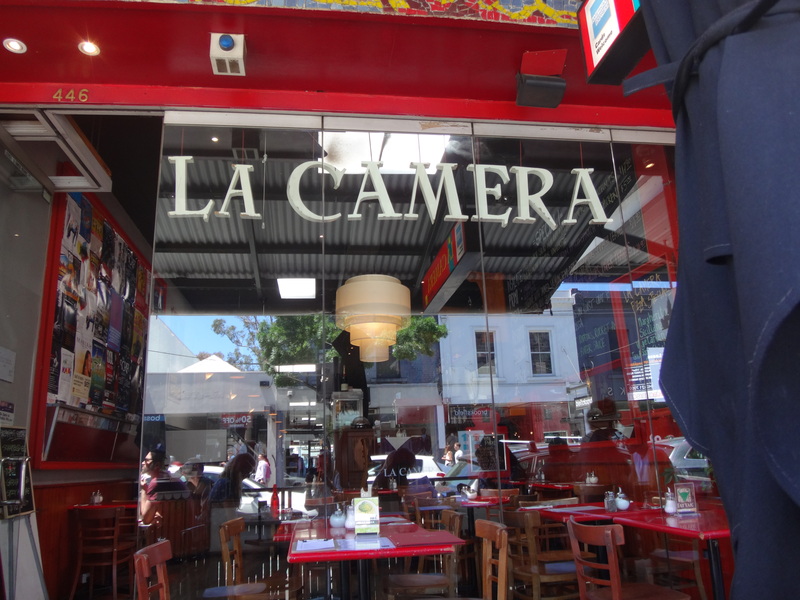 After browsing some very exciting Christmas pyjamas (that I will definitely have to go back and buy closer to Christmas) we settled on a bright looking restaurant called La Camera. Bright and cheery, La Camera’s staff were as pleasant as the exterior. We had barely entered before we were greeted by a very enthusiastic Italian lady we presumed to be the owner. Warm and welcoming we asked to browse the menu, a quick glance to find Eggs Benedict and I was happy to stay. 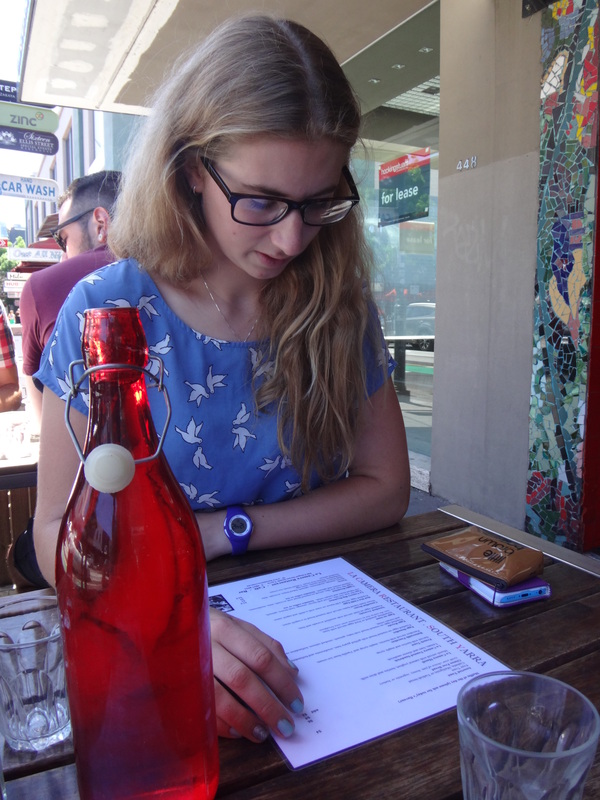 The weather was lovely, nice and warm without being oppressive and with the novelty of being able to dine al fresco far from having worn off, we grabbed a seat outside and waited for the rather charming waiter to get us some water. The restaurant was starting to fill up as we arrived, with the brunch to lunch crossover hitting it’s peak, but none the less the service was friendly and efficient. My mocha was nice and strong, there was a good hit of coffee, which was exactly what I needed: a lazy morning getting up late and heading straight out for brunch had meant that I had missed out on my morning coffee and for a self-diagnosed caffeine junkie as myself, it’s noticed. Again it was just warm, but that’s something I’ve come to expect from mocha’s in Melbourne and if I’m after a hot drink then I’ll plum for an Americano instead. 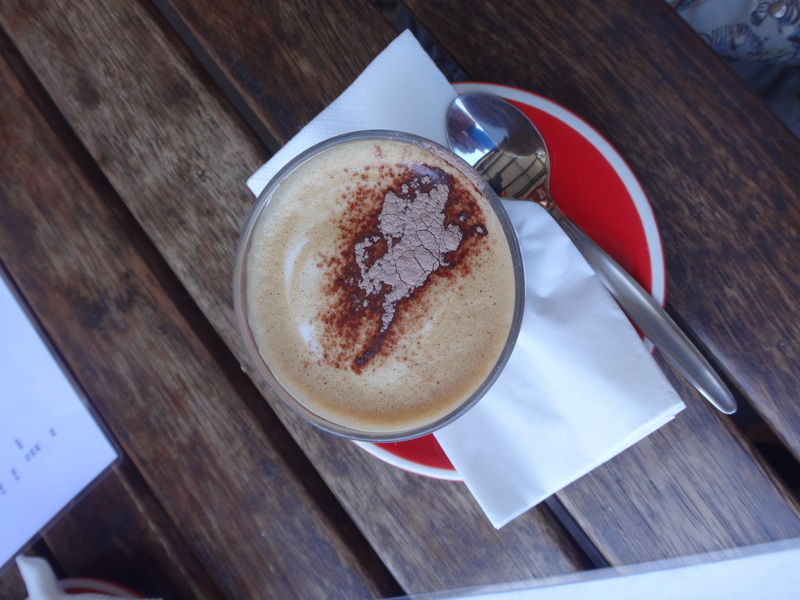 The only niggle I had, and it’s a niggle I’ve been having with mocha’s Melbourne over is the cocoa dusting is always so careless. I like my chocolate to be dusted into shapes, or at the very least all over and not just in a haphazard line. It looks like the top has fallen off the chocolate shaker and they’re spooning it out in the hope they can feign delicacy. When my eggs Benedict arrived I was pleasantly surprised. The mushrooms were an added extra I wasn’t expecting and despite the fact I can take or leave mushrooms, they were the perfect brunch accompaniment this morning. The toasted sour dough was a nice change to the muffin and texture wise it complimented the mushrooms, something with a bit of crunch against the softness of the rest of the meal. The eggs were hand poached, which I always get very excited about and my yolks were runny; something I’ve found has fast become my favourite part of the meal is cutting into a poached egg and seeing the yolk ooze out onto the plate. The ham was thin and smoked and delicious: I’m not always a ham person and when I do have it, I want it to be wafer thin. I loved the little bit of rocket piled on top and the sauce was nice, but there wasn’t enough of it. There was something about the sauce I couldn’t quite place as well, it was buttery of course, but there was a tang to it that I wasn’t sure was mustard or something else: it was a delicious hollandaise, I just wanted more of it. The presentation was wonderful, I loved the plates and the bright red water bottles were a great injection of colour: I’m a huge fan of bright food and bright places to eat. Being able to sit outside was wonderful, although we had a strange moment when a car pulled up next to us, honked and the driver pointed to his friend in the passenger seat (who was hiding his face) and waved rather enthusiastically. Unfortunately they were stuck in traffic so this went on longer than one would have liked. I panicked and responded the only way I knew how: by filling my mouth with a giant mouthful of food and silently chewing. The staff were incredibly friendly, the service was fast and you feel welcomed the moment you step into the restaurant. The outside seats were on the right side of the road to enjoy the last of the morning sunshine and the tables weren’t too close together – as can often be a problem with outside dining. 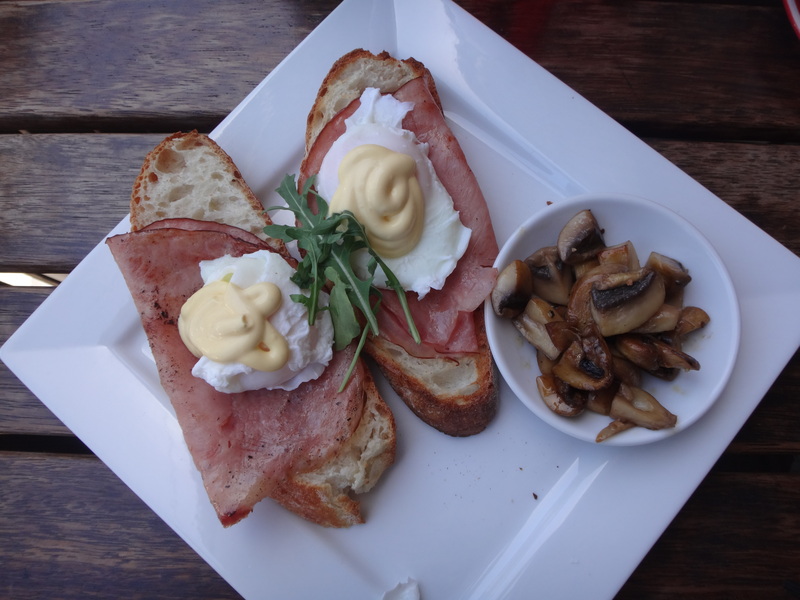 Presentation was fantastic and my mocha was nice and strong, I would have liked a bit more hollandaise but the sour dough was a nice twist and the mushrooms really made the meal for me today.